Our Catania cruise port guide gives you information about the docking location, cruise dock, transportation options and much more! 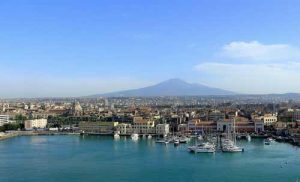 Welcome to the Catania cruise port guide. Catania lies in the shadows of Mt Etna on the “ball” of Italy. This charming town is one of the oldest and largest cities of Sicily. The presence of Europe’s largest volcano shapes this town to this very day. Several eruptions throughout history have covered this city by lava and the earthquake of 1693 almost completely destroyed Catania yet again. The city was rebuild with lava brick in the Baroque style making this grey city unique in the world. 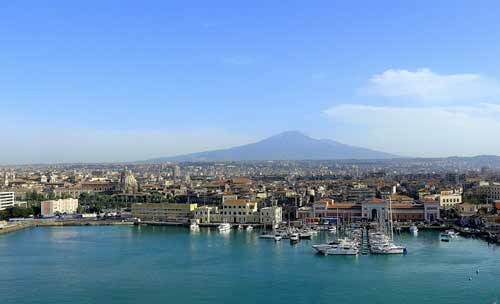 Read the cruise port guide underneath to know about where your ship will dock in Catania. 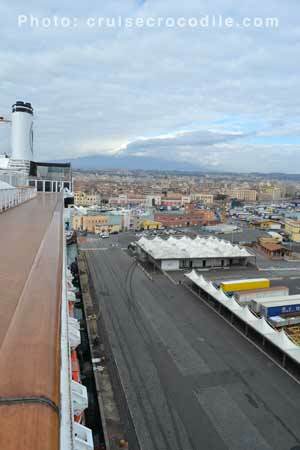 When your cruise ships approaches the port of Catania you will have a beautiful view over the town of Catania with Mt. Etna in the background. Cruise ships dock at the Catania’s cruise dock. Shore excursions busses will be waiting for you on the dock. 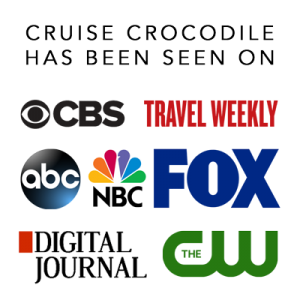 The white tent at the dock is the cruise terminal where you will find tourist information, wi-fi and taxi services. Catania is one of the oldest towns on Sicily. You will find ruins, medieval and baroque style architecture all over town. Cruise ships dock at the Catania cruise terminal in the port of Catania. Inside the cruise terminal you will find several facilities like: tourist information wi-fi shops taxi service The Catania cruise terminal lies about 1,5 km / 1 mile from the city centre. You are free to walk and some cruise lines even offer a shuttle service into town. Catania’s old town is quite small which makes it a great walking town! Another opportunity to explore the island of Sicily is to rent a car at the port of Catania.There is an Avis car rental at the exit of the port. See its exact location marked in the map above. One way taxi from cruise terminal to city centre: 10 euro One way taxi from cruise terminal to the airport: 20 euro One way taxi from cruise terminal to Lido Azzuro (beach): 15 euro Tour of Catania: 50 euro (1,5 hours) Tour of Taormina: 150 euro (3,5 hours incl. 2 hours free time) Tour of Siracusa: 150 euro (3,5 hours incl. 2 hours free time Tour of Etna: 150 euro (3,5 hours incl. 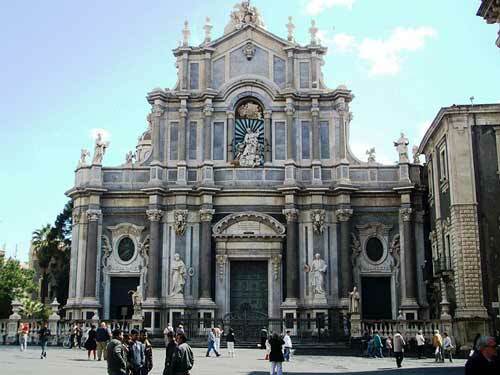 2 hours free time) Tour of Etna and Taormina: 250 euro (5,5 hours incl. 3,5 hours free time) Tour of Caltagirone: 165 euro (3,5 hours incl. 2 hours free time) Tour of Piazza Armenia (3,5 hours incl. 2 hours free time) The taxi prices above are per taxi, up to 4 people. Prices above are not set and you should always agree upon a price before stepping into the taxi. This is the largest active volcano of Europe that has gotten quite a reputation. This world miracle and eye catcher of Sicily offert a rare opportunity to visit an active volcano. Drive or walk one of the many road on the volcano. Because of the distance we recommend to go with a taxi or shore excursion. Taormina might just be the most well know town of Sicily. This renowned village is famous for being a tourist town, historic landmark and for its amazing dramatic scenery. It offers the perfect combination for a day out! Reach Taormina by train, taxi or public bus. This is the Catania cruise dock. The cruise dock and cruise terminal are conveniently located in front of the city of Catania. You can easily explore the city by foot or chose another form of transportation. 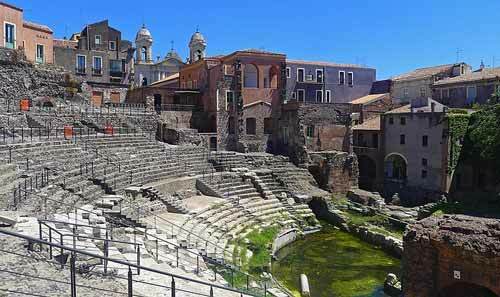 Read all about your options in the full Catania cruise port guide.